Just in time for the start of baseball spring training, I finished John Grisham’s venture into America’s pastime, Calico Joe: A Novel, and I finished it with a tear in my eye. A Christmas gift from my eldest daughter who obviously “gets” both her dad and The Single Father’s Guide to Life, Cooking, and Baseball, Calico Joe: A Novel is the fictional account of a Chicago Cubs rookie phenom, Joe Castle. Joe hails from the tiny town of Calico Rock, Arkansas. Hence, Joe gets the handle "Calico Joe" from a sportswriter. During the summer of 1973, the Cubs call up Calico Joe from the AA minors to fill the roster spot of an injured player. No one expects much from him, but Joe sets a number of rookie records. Joe Castle has a incredible potential and becomes the talk of baseball. Castle’s walk-the-talk confidence has Cubs fans believing that the "Curse of the Billy Goat" may finally be broken. Paul Tracy is Joe’s biggest fan. Paul is the 11 year old son of New York Mets’ #5 starter, Warren Tracy. Alcoholic and a lifetime sub-.500 journeyman pitcher, Warren Tracy has a reputation of being a headhunter. (For those not familiar with baseball jargon, Warren Tracy has lost more games than he’s won and throws at batters as a means of intimidation.) During a series at Shea Stadium when Warren Tracy believes Calico Joe has not only showed him up during the game, but also showed him up in the eyes of his son, the Mets' hurler throws at Joe Castle’s head. The results of the bean ball are devastating both for Castle and for Tracy. A story of reconciliation, Calico Joe: A Novel is narrated by Paul Tracy, now a father and a journalist, decades after that infamous pitch. There is no love lost between Paul and Warren and conciliation can only go so far after years of broken promises and broken dreams. Still, for Warren Tracy and Joe Castle, an apology and forgiveness can change lives. 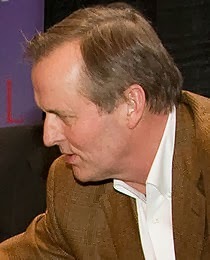 I’d been an avid John Grisham two decades ago when his legal genre novels like The Pelican Brief and The Firm were the pinnacle of popular fiction. 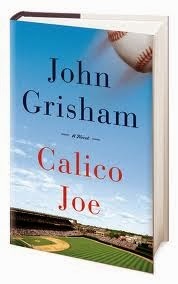 I think Grisham has a nice, simple story with Calico Joe. He acknowledges as sources Chicago Cubs shortstop, Don Kessinger, and St. Louis Cardinals manager and eventual Hall of Fame inductee, Tony LaRussa. Still, some of the accounts seem overly contrived and at least one conflict Grisham sets up, specifically the potential difficulty that Paul might have with Joe's brothers, Red and Charlie Castle, is too easily resolved. In all, though, Calico Joe is entertaining, easy, and somewhat evocative reading. Now, who’s ready for Opening Day? So, when your eleven year old daughter is babysitting her nine year old sister and her five year old brother and the two of them conspired to "do" their five year old brother's hair, you let them. Came across this video recently when I was looking through some old files. It's great! Based on the time stamp, The First Beautiful Daughter recorded this on a weekend day afternoon in February 2009. Not sure I was actually out of the house or just downstairs cooking something or just watching college basketball or something on television. Regardless, this is really a cute record of a The Favorite Son when he was willing and able to allow his sisters a little coif creativity. He's not quite so cooperative anymore. Their little voices are adorable! As a graduate of the University of Missouri, I am extremely proud of soon to be fellow alumnus, defensive end on the Cotton Bowl Champion Missouri Tigers football team, Southeastern Conference (SEC) Defensive Player of the Year, and future NFL draft pick, Michael Sam. 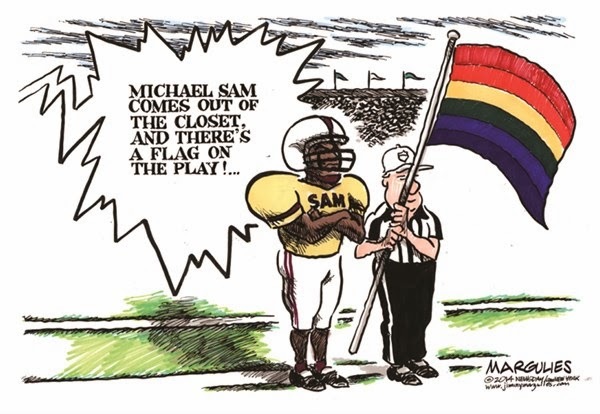 Why am I so proud of Michael Sam? Well, his mental toughness, his dedication to strength and conditioning, and his fearlessness on the field as he shredded offensive lines and struck fear in the hearts of SEC quarterbacks were, in part, the reason Missouri was a game away from playing for the National Collegiate Athletic Association Football (NCAA) Championship. Sam was an integral part of the reason the Missouri Tigers finished #5 in the final NCAA Poll this year. Do I care what Michael Sam does in his bedroom? Do I think Michael Sam is brave for disclosing his sexual preference? It isn’t necessary for my pediatrician or my electrician or the checker at the grocery store or the barista who makes my coffee to disclose to me how each satisfies their sexual needs. What I need to know is whether my pediatrician can take care of my children when they’re sick, whether my electrician can safely wire my breaker box, whether the checker charges me the right amount for my groceries, and whether my coffee tastes good. 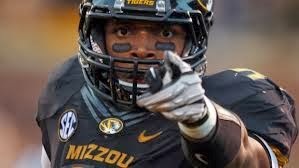 The only thing that has been important to me about Michael Sam is his ability to make Missouri’s defense more effective. All I’ve cared about whether Michael Sam could do his job. Clearly, he could and did. Similarly, readers of this blog or my books should only care whether my writing is interesting, educational, and entertaining. Readers should not care about my romantic preference. Because it's become so popular to do so, however, she's a mom, a fisherwoman, a photographer, and an entrepreneur. Clearly, I'm the brave one. There was a girl I knew peripherally when I was in high school. Let’s say she was a very close friend of someone who was very close to me. The girl was cute. The girl was fun. The girl smiled all the time. That smile, however, masked an insidious truth. That truth? Every summer when her parents delivered her to her grandparents’ Midwestern farm to for a weeks-long visit, the girl’s grandfather molested her. Those visits began when the girl was a toddler and continued through her early teenage years. The girl didn’t disclose the truth about the abuse until she was in high school. As a father of two beautiful daughters and an incredible little boy, when I hear about the sexual abuse of a child, I literally become sick to my stomach. Frankly, I don’t believe there is a punishment gruesome enough for a monster who takes advantage of a child’s trust and destroys a child’s innocence. If one of my children would ever have been or will ever be the target or victim of a predator, well, I can only say that the authorities had better find him before this country boy does. Pretty hard to read, huh? Just like in the case of the girl I knew peripherally when I was in high school, the sexual abuse described by Ms. Farrow at the hands of Mr. Allen is sickening. No parent, no one who has a shred of decency would knowingly permit such a horrific thing to happen to a child. No parent, no one who has a shred of integrity wouldn’t want the perpetrator punished, at the very least, to the utmost extent of the law. So, what’s the problem? Mr. Allen should die a long, slow death, right? Well, not so fast. While our legal system provides for a presumption of innocence, which “requires the government to prove the guilt of a criminal defendant and relieves the defendant of any burden to prove his or her innocence[i],”just the accusation of sexual abuse is tantamount to trying and convicting the alleged offender in the court of public opinion. Such an accusation can and often does destroy a person’s reputation, family, and career, and that’s not fair. 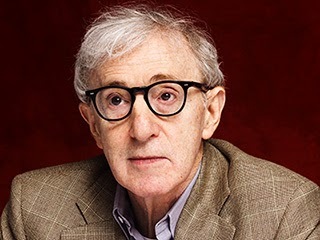 In addition, and I want to be very careful and be sensitive to Ms. Farrow’s perception, Mr. Allen is not a criminal defendant. The allegations of abuse were investigated by competent authorities twenty-one years ago. According to author and former prosecutor Linda Fairstein during an interview on February 4, 2014 on Imus in the Morning Show, Ms. Farrow received extensive observation and treatment for about six months and no evidence of physical abuse was discovered. No charges were filed. In the case of Ms. Farrow and Mr. Allen, the allegations of sexual abuse are sickening. Still, it comes down to this: there are at most two people who really know what happened and what didn’t happen. Perhaps, there is only one. Considering the fact that Mr. Allen is not a criminal defendant and considering the gravity that society assigns to simply a claim of sexual abuse, I believe people and, in particular, the media must be responsible in their accusations and reporting. In the end, for both the sake of Ms. Farrow and of Mr. Allen, I sincerely hope justice is served. [i] “Presumption of Innocence.” www. http://legal-dictionary.thefreedictionary.com/. Accessed February 4, 2014.